Hostas have been my best friend since I began gardening two years ago. While I can’t tell you that in just two seasons I have mastered the art of landscape and have a garden full of rose bushes and a prize orchid, I do have one thing in abundance: hostas. While these low-lying leafy plants don’t have a ton of bright color, they do add substance and consistency to your green space. 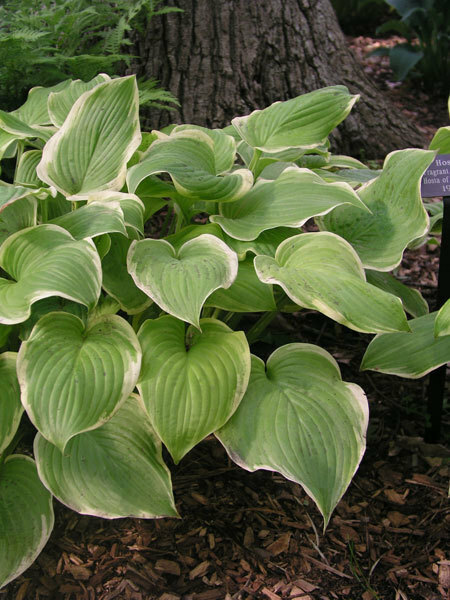 Hostas will grow in shade or son, are perennials and come in just about every texture of green you can imagine. Some species of hosta even come in blue/green and yellow shades. What I truly love about the hosta is its hardiness. In addition to coming back bigger and better every year, hostas can survive in most spaces in your yard regardless of whether they get sun or not. Most experts recommend that hostas be placed in part sun/part shade areas, but my father and I have found that once hostas are acclimated to their space they can survive in full sun to full shade areas. With that said, here are 5 hostas for my newbie gardening sistahs! Heavily textured, huge blue-green leaves cup and twist into a unique display. After a rain, Drinking Gourd absolutely sparkles with small pools of water collected in the deeply cupped foliage. White flowers in early summer. Good slug resistance. Large pale yellow corrugated leaves, with a puckered texture hold their color throughout the summer. Dense circular mounds of August Moon brightens the shade garden with its golden tones. White flowers in late July with a faint lavender blush. Extra wide creamy white borders surround remarkably blue centers in spring. Blue Ivory is eye candy for the Hosta enthusiast. Edges will progress to a clean white as the center deepens to blue-green in summer. Lavender flowers in mid summer. Leaves are smooth and rounded, apple green with a creamy edge. Hosta Fragrant Bouquet forms a large and attractive mound with incredible fragrance in August. Blush lavender buds open to near white and offer quite large flowers. This selection is noted for its vigor and fragrance. PreviousIs Motherhood Your Side Chick? Too Many Apps on Your Phone? It’s Time for a Mobile Phone Cleanse!